I don’t know if Highlight, Glancee, Banjo, or any one of those other startups you’re now officially sick to death of hearing about are going to make it, but I know that for the first time in a long time, we’re starting to move in the right direction in terms of mobile innovation. And no, I don’t mean we need more people-stalking apps, I mean we need more passive use of our mobile phones. Less life lived looking down means more life actually lived. The trend that strikes me here as being important is not necessarily “ambient location” or even “people finders” – that’s just all we’re capable of today. The real end game is engineering serendipity. Each of the new contenders, oddly, has decided to go after the same vertical: people tracking. Perhaps this is the more easy and obvious market to first attack, given the apps’ abilities to run on top of existing social structures like Facebook or Foursquare. But arranging serendipitous encounters isn’t always a function of who you know, it should also be a function of who you want to know. Or who you should want to know, even if you don’t realize you should want to know them. That’s a bigger challenge than any of the new socializing apps can address. Consider this, instead, a giant alpha test in preparation of taking that next step. To move forward, the metrics these startups should be obsessed with should not just be how many users signed up, how many downloads they have, or how many pings they sent out, but how many real connections between people are actually being made. This is the Holy Grail for engineering serendipitous people discovery: alerting users immediately that somebody is nearby, but also making sure that’s a connection the person actually wanted to make. (It’s too bad all smartphones don’t have a nifty proximity sensor in them that can detect when you’re rapidly closing the distance between you and a fellow app user, for example. That would indicate a real connection! There are ways around this, but they’re far more complex than tapping into a provided sensor like the GPS). A good app wouldn’t have even mentioned he was there. A good app would wait until it could say, Steve Wozniak is at the airport…and HE’S RIGHT BEHIND YOU! So yes, all these apps still have a way to go before they even work correctly at their primary function. While I know that it’s one step at a time, I worry that the market will see these apps as tools that do only one thing – merely alerting us to nearby people of interest – and will later give up on them when the trendiness wears off. That concerns me because we’ll then lose sight of other, bigger challenges companies operating in this space could one day solve. Challenges that take time. Not months, but years: engineering serendipity is not just about the who, but also the what, where, how and why. A little history: a couple of years ago, Google’s then CEO, now Executive Chairman, Eric Schmidt spoke of a world where our phones alerted us to nearby shops and deals and discounts as we walked down the street, all personalized to our own interests. Serendipitous discovery of the world around us. Now forgive me for saying so, but a world where Google knows what I want to do before I do it, gives me a chill. Can’t someone else build this first, please? And build it on top of data that comes from everywhere, not just one big Google-owned database? Apps could start by telling you who’s nearby, then slowly grow, until they could alert you about all sorts of things, and do so just as spontaneously. 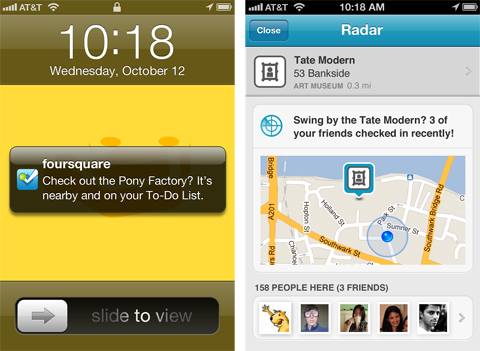 One company already doing this, to some extent, is Foursquare. With its Radar feature, Foursquare is branching out from check-ins to become a tool for exploring by suggesting nearby places and alerting you to nearby friends. In terms of engineering discovery of the world, not just people, it’s already ahead of the trendy background location apps. As CEO Dennis Crowley explained, “what we have been doing with Radar is finding a way for people to use the app really without having to actually use it.” BINGO. But this is all such a new game; anyone can still win. Engineering discovery is a complicated one to solve. For example, it’s a combination of knowing not just where you say you like to shop, but where you’ve actually shopped; not just where you say you like to dine, but where you actually dine. It also needs to know what sort of activities you would want to attend (Concerts? Games? Family friendly outdoor festivals? Dog shows? Plays? ), then ping you accordingly. It needs to tell you of a concert only when there are still tickets left. It needs to know personal details like your shoe size, shirt size, dress size, and then check the in-store inventory levels before it ever bothers you about a nearby sale. And so on. It needs intelligence. Otherwise, the damn thing will be way too annoying. And yes, some of this may not even be possible yet. But it will be, so plan ahead. Oh, and here’s another tricky part: for any app to be able to truly be capable of serendipitous discovery, it would also have to surprise you from time to time with something that’s just outside your typical interests, but where historical, aggregate data from a wide user base indicates that hey, you just might like this, too. So how would any app be able to know all these things? Well, APIs, for starters. Many web companies provide them, but apps tend to build on top of only the social three (Facebook, Twitter, Foursquare). How interesting would it be for apps to build on top of your preferred food-sharing and wine-tasting apps, your travel logs, your Amazon purchases, your credit card statements, your daily deal buys, your past check-ins, your Eventbrite ticket purchases, your Meetup groups, your Kindle e-book collection, your favorite shops at Fab and Etsy, etc., etc.? Oh, and all those your friends like too, of course? Scenario: That guy browsing cookbooks at the bookstore knows your friend Julie and is currently reading the Steve Jobs bio (he’s got it on his Kindle, actually). PING! Scenario: When you were in N.Y., you went to a restaurant your friend Joe recommended and loved it. This local restaurant is owned by the same folks and your friend Jim ate the ribs here two weeks ago and thought they were crazy good. PING! Scenario: That little black dress that’s been sitting in your Amazon cart for 2 days looks a lot like the one this store is selling. And it’s half off. And they have your size in stock. PING! Does any of that sound crazy? Then you’re not dreaming hard enough yet. Or maybe it just sounds terrifying. Well, sorry (old fart? ), but the machines are coming and they want to get to know you better. Unfortunately, not all the data to build a (creepy) understanding of you and your behavior is available via API just yet, but by the time anyone could get around to expanding into all these verticals, that may change. To be clear, the end result is not a scenario where every store you walk by blasts you with a geo-targeted deal, just one store does, and the result is incredibly, almost disturbingly, relevant. The apps don’t tell you about every possible dinner recommendation, only if the restaurant you’re considering now is any good. They don’t tell you about every person you’re somehow connected to nearby, only the ones you really want to know. Or in other words: serendipity means you don’t have to manually launch apps all the time to know what’s going on. The apps launch you. They don’t constantly ping you, and bother you with every little thing. Every time the phone buzzes, it would feel random, but would be meaningful and important to address. Looking at what we have now, well, let’s just say we’re far, far away from that vision. But in the people trackers, we see the first baby steps. And, who knows, at the end of the day, maybe such a thing won’t even be an app, but an extension of the handset itself. Maybe that’s what Siri and its VPA brethren will become. A smarter Siri who doesn’t just wake when you need something, but who, like a real-life assistant, would tap you on your shoulder and whisper, Pssst….Did you know?